YG Entertainment has finally launched a new K-pop group, following its debut of 2NE1 seven years ago. In less than a day, the two debut tracks not only dominated local music charts, but also topped those in Hong Kong, Finland and Indonesia, among other countries. Within two hours of their release, music videos for the songs also garnered a total of over 1 million views on YouTube. YG has often been criticized for its slow and infrequent content production compared to other local entertainment agencies such as S.M. Entertainment and JYP Entertainment. 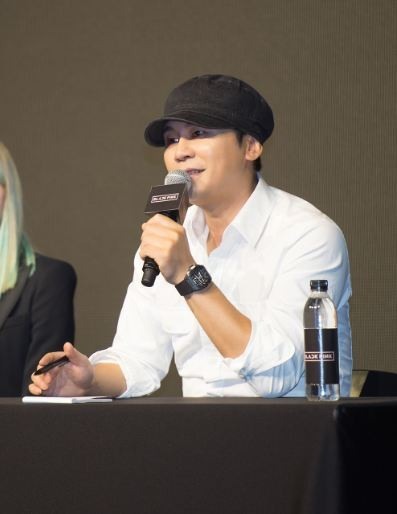 “We try to accommodate our fans’ excitement toward seeing new releases from our artists,” said Yang Hyun-suk, the founder and executive director of YG Entertainment, at BlackPink’s debut showcase at MOSS Studio in Nonhyeon-dong, Seoul, Monday. “However, before sharing our work with the world, we first focus on making sure that our musicians and producers are satisfied with their content,” he added. Although this is the first time the group’s members are presenting themselves under the name BlackPink, they are not new to the spotlight. The group’s main vocalist Park Chae-young -- who goes by the stage name Rose -- was featured in Big Bang member G-Dragon’s solo mini album “One of a Kind” in 2012. Lisa from Thailand, YG’s first non-Korean artist, appeared in the music video for Taeyang’s hit track “Ringa Linga” in 2013. The group’s remaining members Jennie and Jisoo have starred in various YG Entertainment productions during their training period. In the days leading up to BlackPink’s debut, K-pop fans have commented on the group’s similarities to YG’s 2NE1, which also started out as a four-member act. Yang said BlackPink’s look and music best represent the style YG is now trying to achieve. BlackPink will be releasing six more tracks and an additional music video as the group begins its promotional activities. Until then, Yang is eager to share what each member has to offer. BlackPink will make its first broadcast appearance on SBS’ music program “Inkigayo” on Aug. 14.